What do I need to bring with me when I go parasailing? All you really need is a bathing suit or something you don’t mind getting wet. If you have a waterproof camera, great, bring it! Towels are a good idea too, but not necessary. A few minutes relaxing in our Manuel Antonio sunshine and you’re ready to go! Do you include transportation from my hotel or rental house? Yes. All of our parasailing tours include transportation. We will pick you up at your hotel or rental home in Quepos or Manuel Antonio and bring your down to the beach. Almost everyone chooses to stay for awhile after they parasail and enjoy the beach after. Even if you have your own car, we will come and meet you so that you can follow us down, thus avoiding any confusion finding us or trying to park! I can’t swim. Can I still parasail with Aguas Azules? Yes! There really is no need to swim when you parasail with Aguas Azules. You take a few steps on the beach, float through the air and then land in the water. You will be wearing a life vest the whole time and will gently float when you land. Our employees will be waiting next to you in the water at the moment you land and will bring you back to the shore on a wave runner. 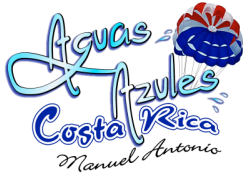 I really want to remember my parasailing experience with Aguas Azules. Do you offer pictures or videos? Yes. We offer a photo package to commemorate your parasailing experience. We get great pictures of you, including closeups (with our 50x zoom, 200x digital) and you out there with beautiful scenery. We also give you pictures that we took of the views from above (we went up with a waterproof camera), Costa Rica Wildlife and many gorgeous sunset views over the Pacific. You will either receive your pictures on an SD card or through an email link, your choice. I am not in great shape. Can I still safely parasail? Yes! Aguas Azules is proud to have sent all different types of people, all shapes, sizes, ages and disabilities soaring along the Manuel Antonio Coastline. You really don’t need any experience or special skills. If you have certain physical limitations, send us an email. We will do everything possible to help get you into the air! How do I find you on the beach if I want to come directly to you? 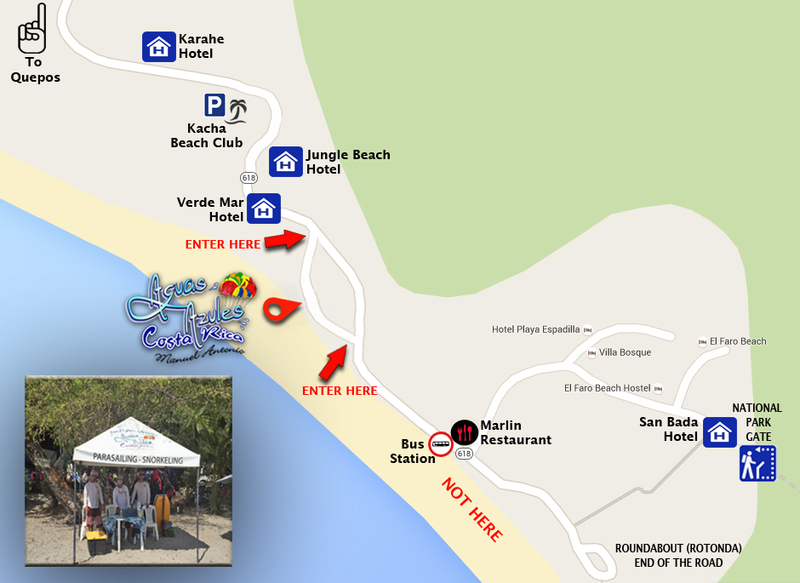 We are located on the public beach in Manuel Antonio in front of a souvenir store called Caycosta. Here is a map with a picture of our tent to help you find us. Always look for our white tent with our name (Aguas Azules!) and logo printed on the tent and for our employees wearing white shirts that say Aguas Azules. Note that the owners, Melanie or Miguel, are almost always there . . . ask for them by name!